Surely, everyone has seen Psycho. If you study Media at high school, you’ve probably studied it. It’s a great film, well structured, and has given the world the shower scene, one of the most well-known attack scenes ever. I’d never thought about the process of getting it made in 1960. The film has adultery, robbery, murder, cross-dressing and whatever it is called with the dead mother’s corpse. Really, it is a surprise that it was made. 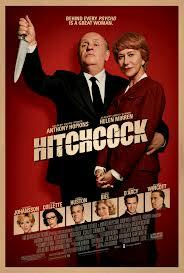 Hitchcock tells the story of Alfred (Antony Hopkins) and his wife Alma Reville (Helen Mirren), their love and her role in his career. It’s a good film. It’s better than good, but a long way from great. The performances are strong, and I wasn’t at all bothered by the extreme make-up used on Hopkins to make him look like Alfred Hitchcock. The story is complete and concise, and tell the story well. But it didn’t blow me away. Interesting, but not overly exciting.